Friends of the Law sets forth a completely new body of evidence that shows how little Luther’s teaching was understood. This new book looks at the doctrine of the Law and invites a new consensus that could change the way Christians view the Reformation and even their daily walk with God. I’m writing simply to thank you and commend you for your excellent book, ‘Friends of the Law’. I finished reading it this afternoon. It clarified many things for me. I’m looking forward to recommending it to my first-semester class in The Lutheran Confessions, due to get underway at Australian Lutheran College. Engelbrecht forces the reader to face the fact that . . . a modernist confessional theology . . . dismisses the law as oppressive. A corrective to often unbalanced understandings of Law and Gospel. 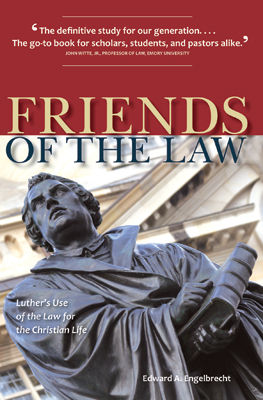 Friends of the Law will be of interest to Luther scholars, parish pastors, and parishioners. Engelbrecht . . . shows that Luther maintained a third use of the law. An important contribution . . . An eminent ecumenical study. Demonstrates convincingly that Luther taught the so-called third use of the law.